Jacek Jeruzal from Poland brought Flandia 2 out indicating to the Ground Jury that he wasn’t sure he would pass. Unusual approach! I am so very grateful for my new Mark Todd Boots and for the fact that I actually packed them! They have come into their own. We’ve been out at Haras du Pin and the conditions underfoot are the most challenging ever. The place is in quite a bit of turmoil and if we thought things were a bit disorganised in the Caen venues, well we have had a rethink! 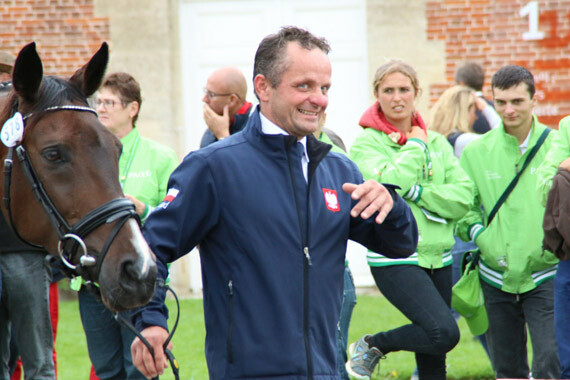 We couldn’t get a start list for dressage before we headed home, and we heard that Erik Duvander, the NZ Team Manager had to report back to the riders their times which he had written down on a post-it! Yesterday was the trot up. I really enjoy trot ups as you get to see the horses and riders much closer than you do when they are in the other phases. The horses looked magnificent, a lot leaner in condition than many events I have been to lately. They appear fit and ready to go. There were the usual few who behaved badly, there were some that looked like they were going to tow their riders back to Caen. ilronan was a handful for Paul Tapner, as was Nereo for Andrew Nicholson. Nereo looked magnificent. However, my personal star of the day was Wesko. What a super looking pony he is and so well behaved. We had some funny moments, like the man from Poland who came out giving the “maybe, maybe not” hand signals to the Ground Jury! They decided he was OK to proceed however. The uniforms are always interesting to compare. The New Zealanders looked very smart, especially the men in their black suits. The French were resplendent in their red trousers. The Dutch men’s ties were great! While they look great, the Canadian’s white trousers must have been a nightmare in this mud. Alex Hua Tian looked fabulous in his three-piece suit. There was a bit of fun trying to find the way in to the trot in first, however. There were several journalists and photographers circling the area trying to find a way through, and eventually many of us all lined up at a side entrance, to be let in ten minutes before the trot up was due to commence. It was a free for all, owners, mothers of competitors, team officials and the media. I heard that Gillian Rolton wasn’t allowed in at one point, but luckily the security man on the fence was corrected and the show could proceed with the Head of the Ground Jury in the right place. The Ground Jury looked great, and it was nice to see them smiling and lifting their hats in greeting to the riders. We had been told that the official media course walk was at 2:30 but as the trot up started at 3, we elected to do the trot up. We then decided we would try our luck at walking the course after the trot up, and proceeded to the first jump. We made it around 80% of the course, just the first few we need to come back to and the last two. No-one asked us what we were doing, but we were very well behaved and kept off the course which was largely cordoned off with signs at every jump saying “riders only”. The ground is fragile enough without us lot trudging all over it. Selena O’Hanlon and Foxwood High (Canada). The course is magnificently presented. The detail in the decorations, the flowers, the carving – all first rate. The fences are big, the hills will take it out of the horses, and there are a lot of questions. I think the last of the three waters will be a huge ask at the end of the course, especially with the going being so wet. It was lovely to see one jump decorated with sheep and another decorated with cows and milk tins so that should make our Kiwi riders feel at home! I must also report that the time and effort spent getting the special car pass is paying off. It gives us a spot quite close to the stud and believe me, that is a real bonus and I think we will treasure that pass in the next few days as the carparks are closed. There wouldn’t be enough tractors in the area to tow the cars out. Who knows what they are going to do on XC day. Seriously thinking we will arrive out here before the sun is up in order to be in position to see the beginning of what is going to be a very challenging course. Dirk Schrade and Hop & Skip (Germany). Tim Price and Wesko (New Zealand).